There are some constraints when adding code in to the orchestrator code. It is because of the replay behavior in orchestrator. This means we should not add following type of code in to it. Fan-out/fan-in refers to the pattern of executing multiple functions in parallel, and then waiting for all to finish. Often some aggregation work is done on results returned from the functions. Let’s see how to achieve this pattern using Azure Durable Functions. If this is the first time you creating a durable function please follow my post Here, it will have the steps on how to create a durable function and activity functions. You have to generate a invoice for a customer, which should include around 20 orders. So First you need to calculate the order amounts for each order then generate the complete invoice. You have a workflow with 3 steps you need to pass output of the previous step to the next steps. Lets solve this with Azure Durable Functions. This will be the starter function which will call the orchestrator function. Once you add the function you would see it comes with set of code for you. Azure Durable Functions are extension of Azure functions which let you write stateful functions in a serverless environment. Let’s discuss some key points about durable functions in this post. Why Durable Functions? 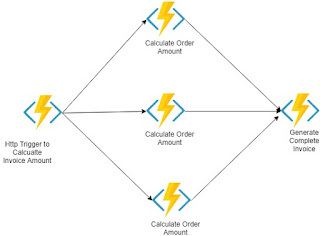 Azure Durable functions came in to picture to solve some scenarios which was difficult to solve using regular azure functions. Issue 1 : Solving Fan in Fan Out Pattern Suppose you have an option in your application where user can select a particular customer and select to generate the invoice for a particular period and send customer and email. Customer would have around 50-75 orders and orders will have custom logics to handle based on order type. So you need to perform logic and calculate the order amount then sum the total amount. So basically you need to achieve following scenario. Solving such a pattern is not that easy with regular function. Issue 2 : Exception Handling in Function chain. If you are familiar with azure function you may already know there are many types of binding. If you are new for azure function bindings you can read more details here. When adding an output binding for your function code there are two ways of doing it. Scenario :Suppose you have a CRM system where you manage all your Customer relationships. There will be 1000 of users connected in this system. You need to have a activity feed panel which will be visible in user’s home page where he can see the activities happening in their company.Ex: New appointment is added with a Customer who I am working withNew Document has been addedSo you need to capture all the events triggering in your CRM system , process them and store to show in user’s activity feed pane. Problem to Solve:There will be thousands of events happening at a second so we need a proper messaging service to store the events which will auto scale with the events load and which enables batch processing and parallel processing.